Material GRP This all round family ski boat will impress you with its spacious interior, superb wake characteristics for slalom skiing and larger peaky wake at slower speeds for the wakeboard enthusiast. This boat will blow your mind with its neck snapping turns and sure footed handling, while still providing Hallett's signature smooth ride in rough conditions. Based on the previously successful Scorpion, the Stinger is the Big Brother. 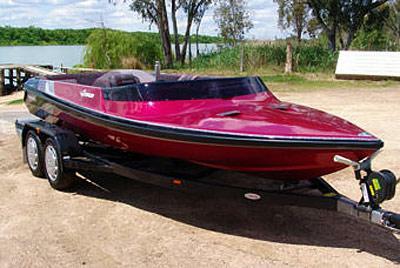 The Stinger is by far the best handling ski boat ever produced by Hallett. The Stinger has dual centre fins providing better grip on the water as well as better straight-line tracking, and phenomenal turning ability. A larger and more user friendly split rear swim deck for easy access over the transom. The transom is specially shaped to stop other boat wakes from swamping your boat when pulled up on shore. The Stinger has flow through ventilation for the engine, Faria instruments. The Stinger comes standard with choice of colours, choice of interior, adjustable drivers seat, a new spacious rear storage under the seats, tilt steering, carpeted ski locker, bilge pump and swim deck as standard. Stinger has a choice of high and low windscreen to tailor the look of the boat to suit your personality.